Toho University was established in 1925 as a University of Science. ATAGO staff visited the Polymer Chemistry Lab that is part of Department of Chemistry. The lab is part of Narashino campus, located in Narashino, Chiba. In this lab, under supervision of Professor Masatoshi Hasegawa and lecturer Junichi Ishii, they do extensive research on polymeric materials such as polyimide or polybenzoxazoles. These resins have the highest level of heat resistance for organic compounds. What sort of experiments do you conduct? In this polymer lab, we do extensive research on polymers' properties and applications. For example, we are developing next-generation insulating materials using polyimide. Please tell us more about your experiments on polyimide. -Dimensional stability under high heat… Since Polyimide is often combined with inorganic materials (copper, ITO circuits, silicon wafers, etc) dimensional stability similar to metals is necessary to prevent problems such as warping or cracking. We strive to optimize such qualities of Polyimide and, ultimately, develop a new resin that satisfies multiple qualities (such as thermoplasticity, transparency) and functions (such as photosensitivity, heat conductivity). An important part of our experiment is to measure refractive index of polyimide film. Dimensional stability of polyimide is dependent on orientation of in-plane polymer chain. 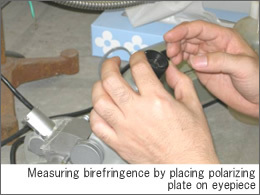 Birefringence is unique to each degree of orientation, so for each polyimide prototypes we use Abbe refractometers to check its refractive index. How do you create these prototypes? 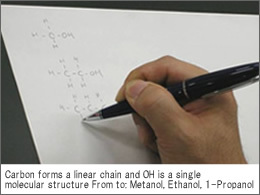 Monomers are combined in a solvent to create polymer chains. This solution is spread out on a sheet of glass to dry, so that solvent will evaporate and only polymers will remain as film. 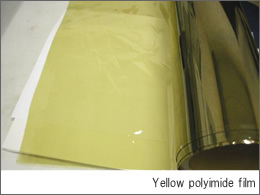 Thermal treatment is given as necessary to complete the polymer film prototype. What is the physical chemistry lab like? It's an interactive lab course that our third year students participate in. About 60 students conduct eight experiments. Each experiment takes about four hours each day, lasting two days. One of the experiments is to measure refractive index. Please describe your refractive index experiment. 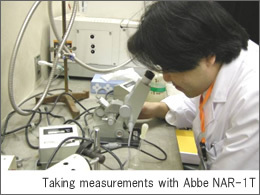 We have five Abbe refractometers, three of which were renewed recently. Each experiment is conducted by a pair of students. There are three main parts to this experiment. Students take measurements of ten alcohols that differ in molecular mass. 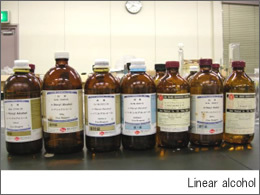 Alcohols used in this experiment are monovalent (contains one hydroxyl group). They then examine the relationship of refractive index and molecular weight. It becomes evident that refractive index is relative to inverse value of molecular weight, allowing the students to find its empirical composition. 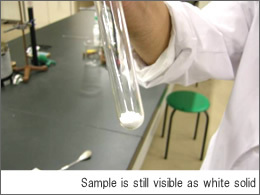 From this empirical composition the refractive index of an unknown sample is calculated and, with comparison to provided data, hypothesis is drawn. Students take various measurements for RI at different degree of mixtures (0~100mol% ) of alcohol-water and heptane-cyclohexane. Using these data students can infer if RI and compositional ratio are related to additive property. There's a large difference in behavior between the two compound liquids. We have our students study how this may be so. *Additive property … When the volume of a compound is the sum of volumes of component atoms. There is no additive property for volume of water and ethanol. Some reasons to this are size difference in their molecules and its strong heterodimeric interaction. In this experiment students measure refractive index of solid. 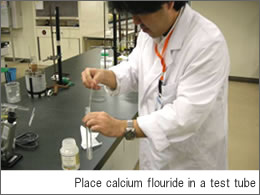 First, calcium fluoride is placed in a test tube. 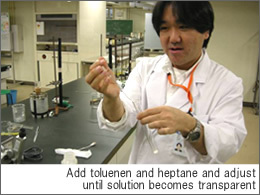 Then, toluene and heptane are mixed into the test tube. 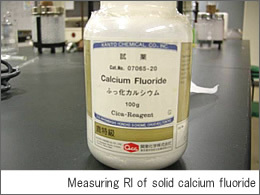 Once calcium fluoride becomes invisible, liquid and solid have the same refractive index. 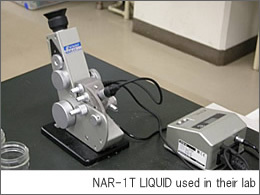 By measuring the refractive index of liquid at this point, RI of solid can also be known. *We refer to this as the Becke line test. Your curriculum is a great learning experience for students. It's very interactive, but also insightful, as they get to actually measure RI and draw hypothesis from their observations. All experiments are simple and tangible. At the same time, it allows for creative assessments, so I get a wide array of reports. Some reports are very insightful, while others are highly observing. All students are very hardworking and eager to learn. 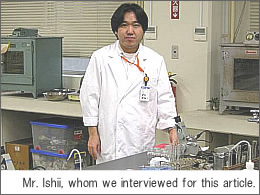 Dr. Ishii, thank you for your help and thorough explanations. We look forward to your continued support. We wish the very best for continued success of Dr. Hasegawa and Dr. Ishii.